Abstract. Since 1978, a series of national surveys (Countryside Survey, CS) have been carried out by the Centre for Ecology and Hydrology (CEH) (formerly the Institute of Terrestrial Ecology, ITE) to gather data on the natural environment in Great Britain (GB). As the sampling framework for these surveys is not optimised to yield data on rarer or more localised habitats, a survey was commissioned by the then Department of the Environment (DOE, now the Department for Environment, Food and Rural Affairs, DEFRA) in the 1990s to carry out additional survey work in English landscapes which contained semi-natural habitats that were perceived to be under threat, or which represented areas of concern to the ministry. The landscapes were lowland heath, chalk and limestone (calcareous) grasslands, coasts and uplands. The information recorded allowed an assessment of the extent and quality of a range of habitats defined during the project, which can now be translated into standard UK broad and priority habitat classes. 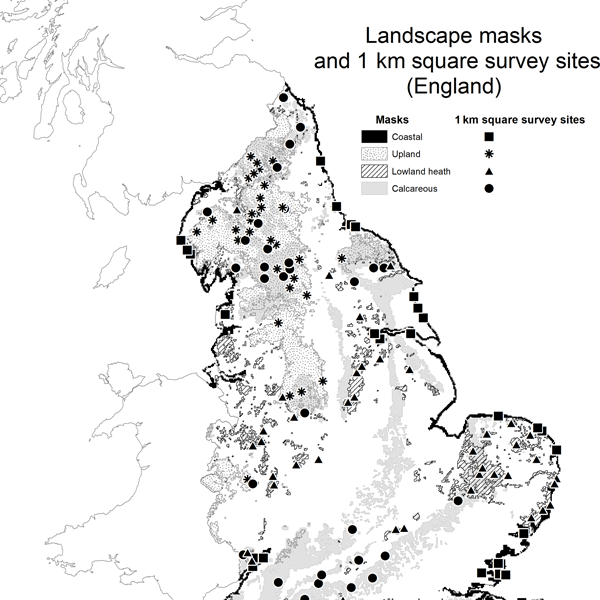 The survey, known as the "Key Habitat Survey", followed a design which was a series of gridded, stratified, randomly selected 1km squares taken as representative of each of the four landscape types in England, determined from statistical land classification and geological data ("spatial masks"). The definitions of the landscapes are given in the descriptions of the spatial masks, along with definitions of the surveyed habitats. A total of 213 of the 1km2 square sample sites were surveyed in the summers of 1992 and 1993, with information being collected on vegetation species, land cover, landscape features and land use, applying standardised repeatable methods. The database contributes additional information and value to the long-term monitoring data gathered by the Countryside Survey and provides a valuable baseline against which future ecological changes may be compared, offering the potential for a repeat survey. The data were analysed and described in a series of contract reports and are summarised in the present paper, showing for example that valuable habitats were restricted in all landscapes, with the majority located within protected areas of countryside according to different UK designations. The dataset provides major potential for analyses, beyond those already published, for example in relation to climate change, agri-environment policies and land management. Precise locations of the plots are restricted, largely for reasons of landowner confidentiality. However, the representative nature of the dataset makes it highly valuable for evaluating the status of ecological elements within the associated landscapes surveyed. Both land cover data and vegetation plot data were collected during the surveys in 1992 and 1993 and are available via the following DOI: https://doi.org/10.5285/7aefe6aa-0760-4b6d-9473-fad8b960abd4. The spatial masks are also available from https://doi.org/10.5285/dc583be3-3649-4df6-b67e-b0f40b4ec895. How to cite: Wood, C. M., Bunce, R. G. H., Norton, L. R., Smart, S. M., and Barr, C. J.: Land cover and vegetation data from an ecological survey of "key habitat" landscapes in England, 1992–1993, Earth Syst. Sci. Data, 10, 899-918, https://doi.org/10.5194/essd-10-899-2018, 2018.